Robe Prolight 2019 post show Lost Worlds 3, Photo: Louise Stickland. 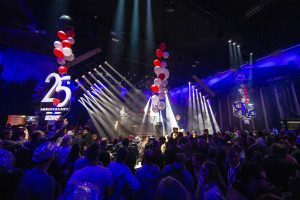 Robe celebrated 25 years with style and flair at Prolight+Sound Frankfurt 2019 with its largest and most dynamic booth to date – also one of the biggest in the exhibition – which provided a dramatic backdrop for the show-stopping finale of the “Lost Worlds” trilogy of live shows, complete with seven dancers, a specially compiled soundtrack and over 300 of the newest Robe moving light fixtures. On the Wednesday night, a special ‘Robe Silver Jubilee’ Party rocked the booth and over 1000 guests joined the Robe Family to be entertained by Czech ‘glamtronic’ electro swing band Mydy Rabycad, who interrupted their current European tour to stop off and delight the audience, getting Hall 12.1 of the Frankfurt Messe vibed for this landmark occasion. Robe CEO Josef Valchar got the party started in a short kick off speech, thanking everyone for their vision, enthusiasm and commitment to the brand. “It’s been a fantastic and inspirational journey in every way by an extraordinary team with whom I am very proud to work! Here’s to the next 25 years” he stated. The live show ran eight times a day, and the booth was constantly full for all four days of the event, packed with people as Robe enjoyed the buzz and international flavour of the exhibition and highlighted three exciting new innovations: The SilverScan is the first in a range of ‘silver jubilee’ products from Robe and the result of a ’favourite technology’ study covering the last quarter century! By popular demand and recalling the roots of the Robe DNA, SilverScan combines the speed, brightness and effects that everyone loved from the ‘crazy scan era’ with the tech available 25 years on… to produce a fantastically reliable and affordable multi-use product. Robe Prolight 2019 post show 25 Party. Photo: Louise Stickland. The brand new T1 Wash is the latest product in the ground-breaking T1 series of refined LED luminaires specifically designed for theatre, television and touring, featuring Robe’s MSL™ (Multi-Spectral Light) LED engine and an impressive 10,000 lumen output. The iPointe is a powerful and flexible IP65 rated moving light combining innovative ingress protection with the spectacular effect features of the best-selling MegaPointe, in a truly unique all-in-one fixture for festivals, concerts and outdoor events or any scenario needing to deal with inclement or unpredictable weather. Around 40 metres of custom-made rain-curtain track was integrated into the booth show production design to illustrate the iPointe’s water resistance as the Explorer character – star of the Lost Worlds story – finally reached her destination of the lost city of Atlantis to unlock the secrets of the SilverScan and the T1 Wash! The storyboard was again originated by Robe’s own creative team led by Nathan Wan and Andy Webb. 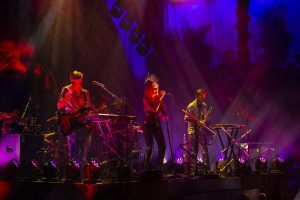 On the lighting design, Nathan was assisted by Jordan Tinnswood, Josh Williams was the technical production manager and the overall stand production was coordinated by Robe’s exhibition manager, Tomáš Kohout, together with the fabulous international marketing department from the Czech Republic. This was the first time Nathan had utilised such quantities of SilverScans, iPointes and T1 Profiles and Washes available for a show, and his goal was to make their effects and features POP! 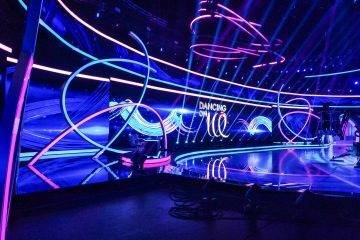 His starting point was the pool design surrounding the stage, specifically modelled so the iPointes could get a good soaking and have the best impact on the show treatment. 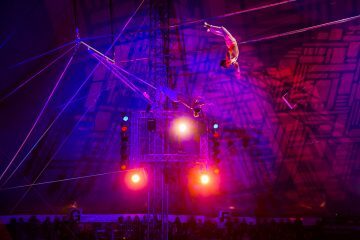 Above the stage was a matrix of 4×4 SilverScans – a vibrant centrepiece programmed to show off their incredibly fast movement, potent output and array of animated funky effects – harking back to the pioneering glory days of the underground rave scene in the 1990s. T1 Profiles and Washes were used to pick out the set and scenic detail and for washing and key lighting, illustrating the high CRI, beautiful skin tones and 5600K ‘purity’ with no green or pink-ness, plus the super-smooth dimming curve which is as authentic as any traditional tungsten dimmed source. Robe’s new SuperSpikie was also active in the show, with six angled diagonal trusses each loaded with six of these incredibly small and punchy units shooting piercing beams all over the performance space and adding whizzy, X Factor razzmatazz to the energetic dance routines choreographed by Jaye Marshall. 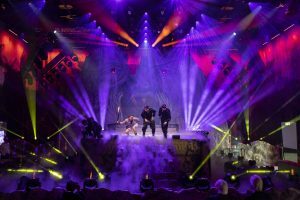 Putting live onstage action right at the heart of the booth in a properly theatrical setting that encapsulated elements from four different environments – stage, television, performance and architainment – proved another big trade show success for Robe. Robe’s new Anolis range of architainment fixtures – Divines and Emineres – illuminated a meeting area tucked behind a set of ‘decaying’ Corinthian columns on one side of the booth – the first time this range of lights has been incorporated fully into a booth design. NRG (Next Robe Generation) students from both NRG UK and NRG Germany were present on the stand making the most of the many informal social and networking opportunities, and to receive a technical tour of the booth from the production crew. Everyone on the production team enjoyed working at Hall 12, which is a completely new space added to the Frankfurt Messe complex. 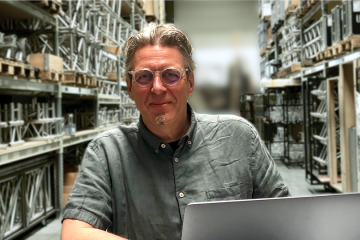 Josef concluded: “It was another fantastic Prolight for us – a dynamic and interesting mix of visitors, many well-wishers celebrating the 25th birthday with us… and a massive interest in our products and brand”.